The Digital Research Library of Illinois History Journal™: The History of Fort Payne (1832) in the Naper settlement, today's Naperville, Illinois. 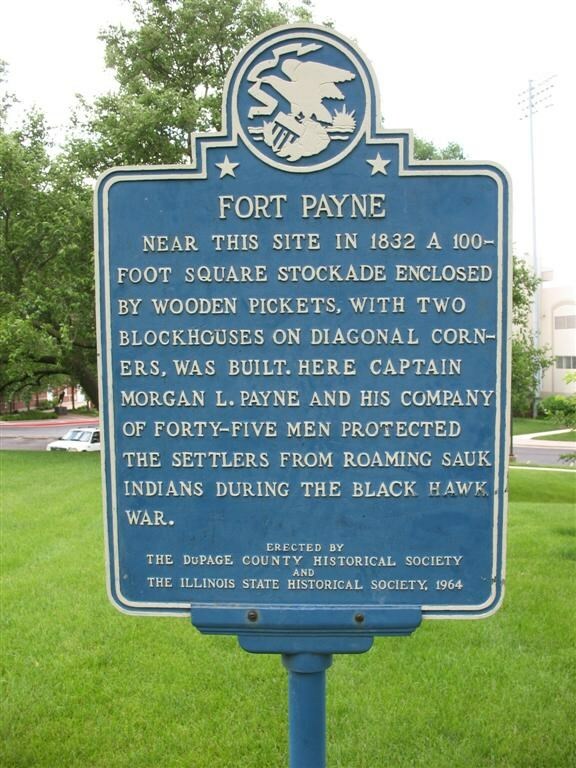 The History of Fort Payne (1832) in the Naper settlement, today's Naperville, Illinois. There were two settlements on the DuPage River, one on the east branch and one on the west branch. That on the east, including the junction, is now embraced in Will county, and the other about the Naper settlement (today's Naperville) in DuPage county. Of course at the time both were included in Cook county. On the east branch of the DuPage river were the families of Pierce Hawley and wife, Stephen J. Scott and wife, Willard Scott and wife, Walter Stowell and wife, Israel P. Blodgett and wife, Rev. Isaac Scarrett and wife, Harry Board man and wife, Robert Strong and wife, Seth Wescott and wife, Lester Peet, and a hired man at Hawley's and another at Boardman's. 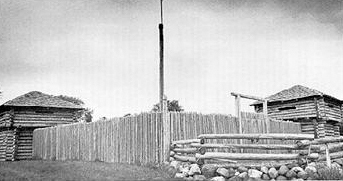 Here was built Fort Naper (1831-1832), a settlers' fortified trading post which today is Naperville. Up the west branch of the DuPage river was the Naper settlement, probably embracing about the same number of settlers. Among these were the families of Baily Hobson, Uriah Payne, Capt. Joseph Naper, John Naper, H. T. Wilson, Lyman Butterfield, Ira Carpenter, John Murray, R. M. Sweet, Alanson Sweet, C. Foster, J. Manning, H. Babbit and others. This is where Fort Payne (1832) was built. In the summer of 1831, Joseph Naper sailed from Ashtabula, Ohio, with his family, his brother and 13 other families headed for Fort Dearborn, Cook County, Illinois. Upon arrival in July 1831, they sold their boat, the Telegraph, loaded up ox carts, and headed to a spot 30 miles west on the DuPage River. By September, Naper and other settlers had secured a contract with a schoolteacher and within a year had a horse-driven sawmill and trading post established. In the spring of 1832, startling news that Black Hawk was on the war path and all town building activities ceased temporarily. Aptakisic (Hafda), a friendly chief of the Potawatomi, whose name was translated as "half day." (An early cartographer misspelled Hafda as "Half Day," as in Half Day, Illinois, and so it remained.) sent a message by Shata, to Bailey Hobson, express from the Potawatomi village at Big Woods (in today's Joilet) advising the settlers to go to Fort Dearborn in Chicagou as rapidly as possible. He said that people were being massacred south of the settlement. Fort Le Pouz (1729-1730), a French fort, was located in Big Woods. Joseph Naper was chosen as the captain of the first military organization in Cook County (DuPage County was formed on February 9, 1839 out of Cook County) to serve in the defense against Black Hawk in northern Illinois. About the middle of June, General Atkinson detailed Captain Morgan Lewis Payne (1805-1878) of Joliet and fifty volun­teers from Danville to build a fort in the Naper­ settlement. 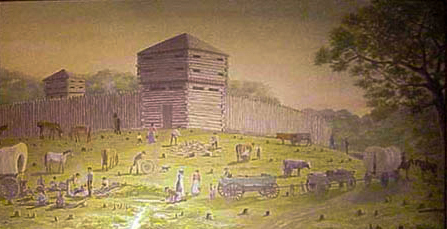 Fort Payne was constructed on the property of Lewis Ellsworth. It was a stockade type fortification about 100 feet square, surrounded by pickets set in the ground. 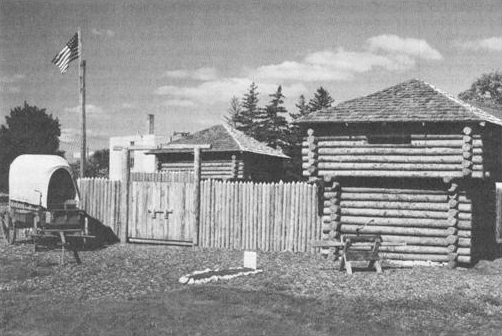 Two blockhouses on diagonal corners were built with openings to view of the prairies from all directions. An incident occurred just before the completion of the fort, which threw a gloom over the minds of the settlers, and excited fears which had been entirely allayed by the prospect of a speedy protection. Two men, named William Brown and Mr. Buckley, were sent to [Alanson] Sweet's Grove (near today's Odgen Avenue) to procure a load of shingles. They had gone as far as the grove, north of Mark Beaubien's place, when Buckley got out of the wagon to open a passage in the fence. Brown drove through into the field, and the team continued to move on, while Buckley walked leisurely along behind. Suddenly the sharp report of a rifle was heard from an adjoining thicket, and Buckley saw his comrade fall dead from the wagon. Terrified and bewildered he fled toward the settlement. He reached the fort with scarcely strength to communicate the melancholy tidings to his sorrowing companions. About twenty men left the fort and proceeded to the scene of the disaster. The horses had been stripped of their harness and taken away, and the body of Brown was found near the wagon, pierced with three balls. He was brought to the fort and buried. The trail of the Indians was followed, but they had fled beyond the reach of pursuit. As much alarm now prevailed throughout the company, it was decided that Capt. 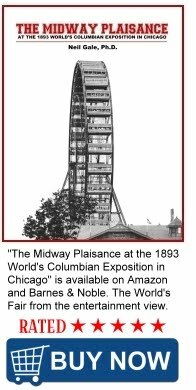 Naper and Alanson Sweet, should start that night for Fort Dearborn to procure more men. They started on horseback, but Sweet's horse giving out, he was obliged to journey on foot. They reached Fort Dearborn early next morning, and asked assistance from Gen. Williams, who was there with three hundred troops from Michigan, but he refused to furnish it, "as he did not deem it safe to send men into the country at that time. At length Major Wilson informed Capt. Naper, that if General Williams would consent, he would take some of his men and return with him to the settlement. Whereupon, a council of officers was held, but it was deemed unsafe for any to go, even as volunteers. Capt. Naper then left Fort Dearborn and returned to the settlement, very disheartened. Filled with fear, families quickly located one another in the vast prairie settlement and packed their clothing and provisions for the journey to Fort Dearborn. Cros­sing the prairie was slow and escape difficult. Roads were no more than muddy ruts. Wheels became embedded in marshy soil and fresh water was not readily available. The Hobsons spoke of traveling thirty-six hours without food. Mrs. Hobson is said to have frequently used her shoe to dip water from the pools by the roadside in order to get a drink. No battles took place at Fort Payne, for General Winfield Scott made a treaty with the Sauks at Rock Island, thereby ending the Black Hawk War. The settlers once more resumed the task of subduing the wilderness. Today, a smaller replica of Fort Payne is located at the Naper Settlement Outdoor History Museum, a presentation of the community’s history as told through its historic buildings.